Play Agent Jane Blonde Returns Slot Online with 500 Free Spins! Agent Jane Blonde Returns is a 5 reels, 15 paylines Online Slot Game by Microgaming. Agent Jane Blonde Returns has Respins, Wilds, Scatter Symbols, and Expanding Wild features and an RTP of 96.6%. You can play this great online slot game here at Rose Slots, which is also home to more than 500 leading UK online slots such as Fluffy Favourites, Starburst, Rainbow Riches and Great Rhino. She’s back! 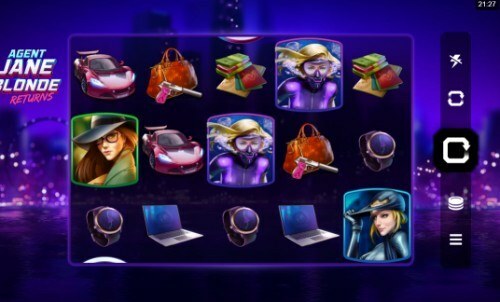 Just like the world’s most famous secret agent James Bond is soon scheduled to return to cinema screens with the 25th movie in the franchise, the most famous secret agent in online slots has returned with a sequel of her own. It’s been over a decade since the release of the original and much-loved Agent Jane Blonde. The first slot, starring the female answer to the legendary British 007, remains popular with players to this day. Time and technology have moved on for online slot games since then, though, and this fresh lick of paint was both overdue and eagerly anticipated. You'll be familiar with the idea behind Agent Jane Blonde Returns if you've ever seen a Bond movie. It's set in a world of counter-intelligence and secrecy, where a special agent operates outside of the confines of the law. If you can help her in her mission, she can reward you with plenty of winning lines. Given the huge gap between Agent Jane Blonde Returns and the original, there's an obvious visual difference in presentation. This is a smoother, slicker and better-looking slot game. Microgaming has been hard at work in the graphics department to make sure that this is a cinematic production, looking bang up to date and good enough to rival any other 2019 release. But is there more to it than just a facelift? All of the symbols in this slot are in keeping with its theme. The lowest value of them appears to be a simple wrist-watch, but given what we know about secret agents and their gadgets it’s likely to have hidden powers! There’s also a laptop computer, a travel pack including Jane’s passport, a handbag and pink gun, and of course a luxury sports car. No self-respecting secret agent would be seen dead without one - even if they’re not exactly inconspicuous. The more valuable symbols here are Jane herself in a variety of disguises. She can change her hair color and her outfit to blend in with a crowd and go on undercover missions, but you'll still recognize her when she appears on the reels - especially if she forms part of a paying line. The slot also features a wild symbol, which is Jane Blonde herself free of any disguises, and she stacks on the reels to boost your chances of winning. She'll substitute for anything apart from the slot's scatter to create wins. The scatter symbol is the slot's logo and provides access to the slot's sole bonus feature. In a way, we have Microgaming to thank for the existence of Rose Slots. They created the first-ever piece of software which enabled casino games to be played online, all the way back in 1994. Ten years later they were bringing innovation to the casino world again when they coded the first ever mobile casino software. They’ve always been a cutting edge developer, and they’ve also always been a leading name in the UK online slots scene. They have a reputation for excellence both in the quality of their products, and the style of their slots. You'll never see an ugly Microgaming online slot. They take a lot of pride in applying polish to the slots they make and don't publish them until they have the ‘wow' factor. That's a habit which has won them a lot of appreciation from the global gaming audience - they were voted ‘Software Supplier of the Year' at the 2018 iGaming Awards, and will have their eyes on the prizes again at this year's ceremony. If you have enjoyed playing slot games from Microgaming, you will probably like to play Agent Jane Blonde slot game and Break Da Bank Again slot from the same developer as well. It feels strange to be talking about only one bonus feature here. This is a modern and stylish slot with HD-era graphics. We've come to expect plenty of bonus offerings with online slot games which are big on design and atmosphere. Instead of providing us with that, though, Microgaming has decided it would make more sense to offer us just one solitary bonus. That might put some players off, but we can assure you that while it may be the only extra feature to play for, it's well executed. The feature is Respins, and it combines with the slot's wild symbol to pleasing effect. Even more pleasingly, you only need to find two scatter symbols to trigger the round. When that happens, the scatters are replaced by wilds, and will stay in place for the next spin. If more wild symbols on your re-spin, these will also freeze and the reels will spin again. This will continue until either there's a spin with no more wilds to be found, or you've completely filled the reels with Agent Jane Blonde wilds. When all is said and done, you'll be awarded with a payout based on the number of wilds and winning lines on the screen. You’ll play online slots with far more bonuses, but if you’re looking for an attractive online slot which is easy to play and triggers its bonus feature fairly regularly, Agent Jane Blonde Returns could be the one you’re looking for. We’d have liked a little more action on top of the solitary bonus - especially given the theme of the slot - but we can’t have everything, and what we do have is fun. Although Agent Jane Blonde Returns isn't linked to the developer's progressive jackpot, it's still worthy of mention. It's the largest of its kind in the world and has even featured in the Guinness Book of World Records. By the end of 2019, it's expected that over one billion dollars worth of jackpot prizes will have been paid out by the fund. One online slot games player in the UK has even walked away with a £16,000 jackpot from one single spin, which cost them 25 pence!